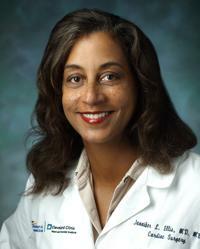 Jennifer Ellis, MD, is a senior cardiac surgeon at MedStar Heart & Vascular Institute. She is board certified in cardiac surgery and thoracic surgery, a member of the Society of Thoracic Surgeons (STS), a Fellow of the American College of Surgeons (ACS), a Fellow of the American College of Cardiology (ACC), and assistant professor of surgery at Georgetown University School of Medicine. Dr. Ellis specializes in treating acquired conditions to the heart such as hardening of the arteries, valvular heart disease, and conditions of the aortic and mitral valve. Her clinical interests include valvular heart disease, heart disease in women, and health care disparity. Her research interests include mitral valve disease. Dr. Ellis received her medical degree from Jefferson Medical College. She trained in general surgery at Lincoln Medical and Mental Health Center in the Bronx. During that time she was a research fellow at Memorial Sloan-Kettering Cancer Center. She then completed her cardiothoracic fellowship at New York University Medical Center. Dr. Ellis performs valve-sparing aortic root procedure, a technique that salvages the native valve. She also performs complex mitral valve surgery through the standard sternotomy or through a small incision on the right side of the chest. Dr. Ellis would like to admit that, unfortunately, she is a golfer. "People are the owners of their health. I am fanatical about educating my patients on health factors that they can control in order to increase their personal involvement and interest in their health care. This attitude leads to positive behavior, such as being compliant with healthy lifestyle choices, which results in better outcomes. The trust I build between my patients and myself is sacred. I have an enormous responsibility to provide my patients with the best care possible. I feel proud when patients tell me that, after the care they have received, they would choose me to take care of their family. I hope to receive referral patients of all severity levels. I am available to consult with referring physicians at any time."